Hybrid Napier (Pennisetum purpuriam) is the best nutritive crop to suit small farmer’s field to produce around the year green cattle feed. 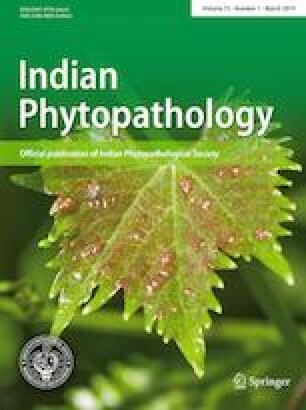 The present study confirms the occurrence of fungal blast disease caused by Pyricularia grisea in India in hybrid Napier. The disease incidence, disease severity, coefficient of disease index, area under disease progress curve are calculated to evaluate the different age group’s host response. It was observed Napier grass allowed to cut once, before rainy season, is more prone to be attacked by the pathogen having disease incidence (89.4% and 91.8%) followed by crop developed from newly planted slips (37.5% and 37.8%), in 2017 and 2018, interestingly hybrid Napier field of 2-year-old were unaffected, surprisingly the paddy crop grown in the nearby field was also free from the disease. Average Plant Disease severity of 5-month-old Napier was (24.1 in 2017 and 21.7 in 2018) and Napier grass allowed to cut (33.6 in 2017 and 31.5 in 2018) and coefficient of disease index was in Napier grass allowed to one cut (3003.84 in 2017 and 2897.2 in 2018) and newly grown Napier grass (903.75 in 2017 and 820.26 in 2018). Area under disease progress curve was in grass allowed to one cut 2555.25 in 2017 and 2172 in 2018 and in the newly grown Napier grass was 1047 in 2017 and 1023.75. Application 1 g/l water Tricylazole has recovered the crop from the disease. The Authors are thankful to the ICAR-Krishi Vigyan Kendra (Farm Science Center) Unnao Uttar Pradesh (India) and ICAR-IARI, New Delhi for providing necessary facilities for field and laboratory work respectively, and ICAR-Agricultural Technology Application Research Institute, Kanpur Uttar Pradesh (India) for required financial support to carry out this research work. Premaratne S, Premalal GGC (2006) Hybrid Napier (Pennisetum perpureum × Pennisetum americanum) var. co-3: a resourceful fodder grass for dairy development in Sri Lanka. J Agric Sci Sri Lanka 2(1):22–33. https://doi.org/10.4038/jas.v2i1.8110.